One-year- olds Courtney and Jade Roper are twins: like nearly all twins they are double the joy and double the trouble. Unlike some twins the Roper Twins love doing things together. They especially love Bath-Times where they have lots and lots of fun. However when one day Nan decides it’s time for a change Courtney and Jade, have other ideas. Join the Roper Twins as they go into battle with Nan in this delightful, engaging and funny look at parenting, everyday life and growing up. What a delightful take on toddler tantrums and bath-time. I think the story is light and funny with enough areas of interest to keep all children within the reading ages and beyond engaged. I found the illustrations vibrant and very clever in the way the additional details add the unwritten areas of the story. The author has really brought our the humour in what can actually be quite a trying time for all involved. Please note that I have read and advanced reading copy of the printed hardcover edition. The additional cool fact about twins and the colouring sheets are a unique and inspired touch! I strongly recommend this one and hope that there will be more future antics from The Roper Twins. This book is Cauline's first step into children's literature and I think she's done a good job in creating a short, simple book that can be read to your young child before bedtime. This book is aimed at 0-5-year-olds and is such a fun read! One-year- olds Courtney and Jade Roper are twins: like nearly all twins they are double the joy and double the trouble. Unlike some twins the Roper Twins love doing things together. They especially love Bath-Times where they have lots and lots of fun. However when one day Nan decides it’s time for a change Courtney and Jade, have other ideas. Join the Roper Twins as they go into battle with Nan in this delightful, engaging and funny look at parenting, everyday life and growing up. The first thing I noticed about this book is that it portrays black characters (the Nan, Dad and the twins.) I think it is so important for children at such a young age to witness different skin colours in a positive environment and also for representation! The Mother of the twins is white which also means that mixed-race relationships are positive and being a biracial child DOESN'T make you an outcast. This book doesn't scream amazing to me, though. It's very repetitive and I can imagine a child getting slightly bored of the same words towards the end. Repetition at the beginning of a book is always good because the child can get to grips with the story, but when it is all the way through, it can make it boring to read for both child and adult. 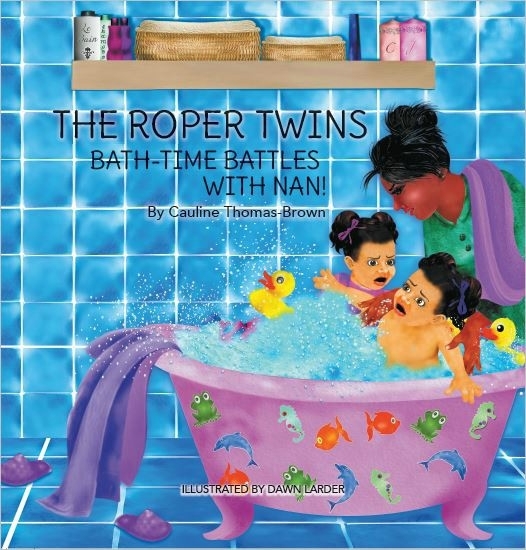 Moaning aside, I thought the book was a brilliant concept as it portrays the twins in an everyday situation: bath time and I know that this is a situation that not all children love, so young children can also relate to the twins on this level. The design of the book is also very eye-catching and the illustrations are amazing; so these will also keep your child intrigued as they have a lot to look at whilst listening to you read to them! This was such a fun book to read and even though it got slightly repetitive towards the end, I think this will be a good book to read to your youngsters before bedtime!